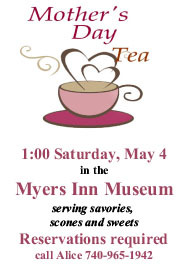 Mother's Day Tea in the historic, Myers Inn Museum, is a local tradition. Homemade savories, scones and sweets make the traditional high tea a mouth watering delight to celebrate a favorite mother. Space is limited so reservations are a must! * Funds raised by the tea help support the museum of local history.